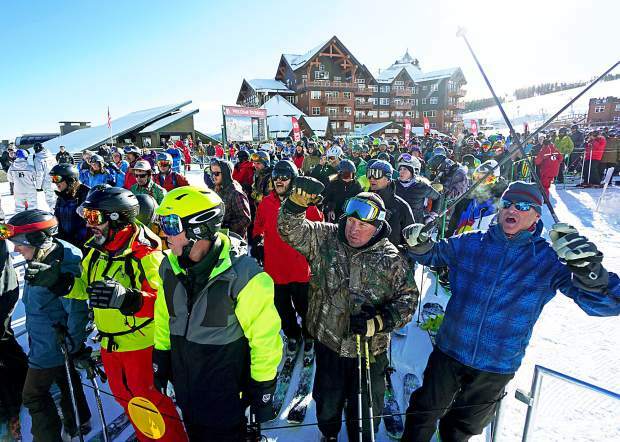 Skiers and snowboarders cheer before the first chair of the 2015-16 ski season at Breckenridge on Friday, Nov. 13. A new economic impact study says the winter-driven industry infuses almost $5 billion into the state's economy. 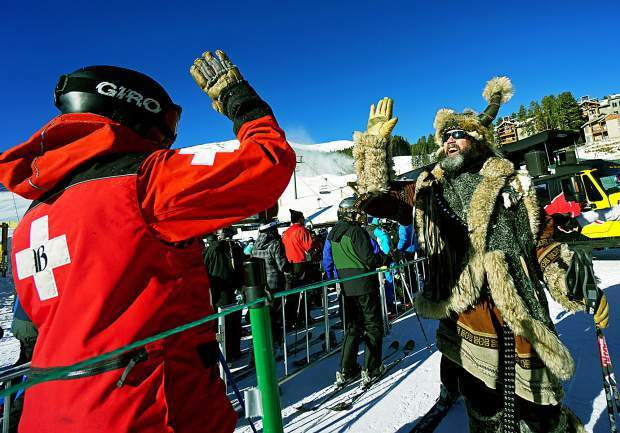 Ullr offers a high-five to ski patrol at Breckenridge opening day this season. Before the holiday rush, patrollers at Breck and Keystone gave tips for proper ski area etiquette, including one simple rule â just be kind. Along with the 1979 Colorado Ski Safety Act, the National Ski Areas Association has developed seven straightforward rules for safety on the slopes. The Your Responsibility Code has been adopted by nearly every ski area in the nation and doesn’t change from resort to resort. 5. Always use devices to help prevent runaway equipment (ex. leashes on snowboards and brakes on ski bindings). No one wants a turkey on the slopes. In mountain town lingo, a turkey is on par with a gaper. Both of them refer to someone — anyone, a veteran or a newbie — who acts totally oblivious out skiing. These folks can be funny at best (ever heard of Gaper Day?) and dangerous at worst. In 1979, Colorado introduced a set of laws to help skiers avoid turkey/gaper mistakes and, in all honesty, protect mom-and-pop ski hills from massive lawsuits. It’s still in place to promote common sense on the slopes, and it’s outlined on every lift pass, trail map and ski resort website. It’s the Colorado Ski Safety Act, and it describes all the risks and responsibilities of anyone who loads a chairlift (or even sets foot on ski resort land). The act has come under fire in the past few years after several incidents, including an in-bounds avalanche death at Vail in 2012, but it’s still the law of the land at local resorts. But what does the act look like on the hill? Before the holiday season, we went straight to the pros by asking Kevin Ahern, director of Breckenridge Ski Patrol for 30 years, and Jon Roberson, director of Keystone Ski Patrol, to answer a few common questions. Who has the right of way on the mountain? Skiing is like driving. The folks in front have the right of way and it’s your job to keep an eye on them — even if they do something unpredictable. This holds true on green, blue and black runs. And, just like a jam-packed interstate, you can’t forget the people behind you. “When you’re skiing in a crowd, just maintain a consistent speed and turn shape, something that makes it easier for the folks behind you to judge where they are in relation to you,” Roberson said. Can I stop and rest anywhere on the trail? You can (this isn’t quite the interstate), but you shouldn’t. Pull to the side of the trail and post up where you’re visible. When skiers and boarders stop below cat roads or rolling terrain, Ahern says it can be impossible to see them in time to stop. But what about those yellow slow signs? Keystone and Breckenridge both use baffles to guide traffic at intersections on busy greens. Try to avoid stopping in these areas — they’re busy enough already — but, if you do, always stop behind a sign, not in front or between them. What should I do if I get separated from my group? Resorts can get busy and hectic, especially over the holidays. Resorts like Keystone and Breckenridge have a system in place to help lost kids and worried parents find each other. If you get separated, find any resort employee (a patroller, a ski instructor, a liftie) and let them know you’ve lost your group. They’ll contact ski patrol and set things in motion. This goes for all Summit-area resorts. If you’re lost, tell an employee — it’s why they’re there. Why can’t I duck ropes? “The easy answer is that those trails are closed for a reason,” Ahern said. Simple enough. Patrollers use ropes, baffles and red bamboo sticks to let you know about a potential danger ahead. Trails can be closed due to grooming, poor conditions and safety concerns, like avalanche danger. Ropes also mark the ski area boundary. Definitely don’t duck those, and only access the backcountry through designated gates. Once you leave the ski area, the terrain is unpredictable and help is a long way off if you get into trouble. What should I do if I leave the resort and get lost in the backcountry? Maybe the better question is, “Why are you heading into the backcountry right now?” There’s untracked snow to be had in them hills, but none of the Summit ski areas have opened backcountry access gates. If you bought a lift ticket, then make the most of it and stay inbounds. It’s never a bad idea to carry a cellphone when you ski, but “they always seem to die at the worst times,” he said. Can I sell my lift ticket? No, and if you do it’s considered fraudulent ticket use. You definitely won’t get on the mountain, and it potentially comes with fines or police involvement. Don’t risk buying a clipped ticket from that guy in the parking lot either — it might not even be valid. What should I know before entering a terrain park? Watch and learn. If you’re new to terrain parks, both Ahern and Roberson suggest watching other skiers and boarders hit the features (from a safe distance, of course) before trying anything. All terrain parks in Summit come with signs for small, medium and large features. The parks are built for progression, so follow the flow and get gutsy only after you’ve mastered the basics. Oh, and please don’t cruise through a park if you simply want to ski. It’s dangerous. What should I do if I see an accident? Accidents happen and things can get heated, but Ahern says a little compassion goes a long way on the slopes. You’re here to enjoy life, right? If there’s an injury, then stay on the scene until a patroller or resort employee arrives. Send a friend or family member to the closest lift to report things, or try calling the emergency number on the back of all trail maps.